The 10 Best French Fries in North Dakota! The mighty French fry. Although some see it as a complement to a main dish, these eateries put the spotlight on fries. Regardless of what side of the camp you fall on, the following restaurants will give you a French fry that is worthy of great acclaim. You will never look at a fry the same again. For over five decades, Scotty’s has been wowing diners with their burgers. Their French fry, however, is equally as worthy of high praise. Their plain fries are amazing, but you can also order cheese fries, bacon ranch fries, chili cheese fries, or poutine (fries, cheese curds, and gravy). Golden, crispy, and soft on the inside. Oh my. Don’t for a second think that the Irish don’t know how to cook a French fry (they are called “chips”). Potatoes have always played a central role in Ireland, and one-of-a-kind fries are one of the results. Irish fries are larger than traditional American fries, giving you more deliciousness for your buck. At Ebeneezer’s, Irish fries are served with Beneez’ sauce. One of the best sports bars in the state, Bridge’s can serve up a mean burger and an even meaner French fry. The bar’s home-style fries are mouth-watering, but their sweet potato fries are even better. Served with a delicious marshmallow side, the sweet potato fries will ruin you for all other fries. Yes, another Irish pub makes the list, which should tell you just how good Irish fries can be. At Three Lyons, the fries are thick and wonderful and can be eaten plain, with gravy, or as “loaded fries,” which includes melted cheddar cheese, chopped bacon, and a side of ranch. Grand Junction has been famous for their fries for many years. 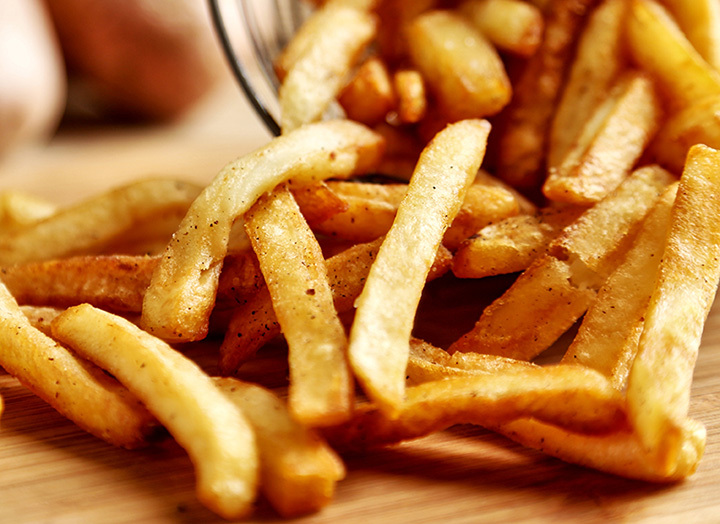 The fries are thin cut, crispy, and seasoned with a mix of spices that will have you begging the crew for the recipe. The restaurant’s sandwiches are made on fresh bread, making a visit a win-win for your taste buds. Herd and Horns is a newer restaurant in Fargo, but it has quickly made a name for itself, especially regarding their fries. Their Buffalo style fries are topped with buffalo sauce, bleu cheese crumbles, diced tomato, diced celery, and ranch dressing. Their sweet potato fries are sprinkled with cinnamon and sea salt and served with maple bacon cream cheese dip. Their loaded fries are topped with cheese sauce, pulled port, barbecue sauce, and bacon bits. Space Aliens: where else can you get amazing French fries and meet a live alien at the same time. The restaurant recently celebrated its 20th anniversary, and they have used that time to perfect their menu. Their fries are thinly sliced, crispy, golden, and out-of-this-world—just like their alien. Wild Hog knows a thing or two about meat… and fries. They are available in either traditional or sweet potato and you will finish them long before your entrée. If you are feeling particularly spunky, try the Wild Hog Smokehouse Challenge, which includes a half-pound of fries. Wurst Bier Hall is consistently voted one of the top restaurants in Fargo. After one visit, you will easily see why. Their French fries are a bit thicker than most, and they are as crispy and delightful as any in the state. Both traditional and sweet potato fries are available. Sweet potato fries are served with marshmallow fluff or sweet chili sauce. Family owned and operated since 1988, the Speedway is the perfect destination for those that appreciate a great burger and fries. Their menu includes traditional fries, American fries, curly fries, waffle fries, and sweet potato fries. It is French fry lover’s dream.